The easy way to interface your existing systems with AddTransit. The AddTransit API (Application Programming Interface) allows you to interact with AddTransit using your existing software programs and on-board vehicle devices. It gives both vendors and transit companies the ability to closely integrate their systems with AddTransit. The AddTransit API enables the interface of the routes, schedules, stops, status and online ticketing into your planning software and accounting packages. Additionally it allows you to transfer data automatically, allowing users to key data once but to have the information available in multiple systems. 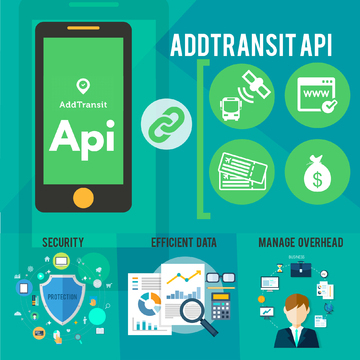 The AddTransit API uses industry standard protocols to ensure security of your data, efficient data transfer and manage overheads. The AddTransit API is currently in BETA. If you'd like to join our BETA program, please do contact us.